There are several reasons why the mEDBG does not perform to the same level as the EDBG/Atmel-ICE. I can't really list everything here, but the short answer is that the EDBG/Atmel-ICE are more polished products than the mEDBG. It has nothing to do with deliberately keeping it slower for the sake of sales, but rather the time spent on the mEDBG implementation vs the EDBG/Atmel-ICE implementation. Ah-ha. That was my understanding. i.e. the 32u4 was full. At some time in the past, I had an XMINI that or AS version that would not update the firmware. I had to solder a 0.05" header and replace the firmware directly with an ATMEL-ICE. As far as I can remember the binary was almost the full 32kB. Anyway the XMINI updated properly after this. In practice it is easier to develop with ATMEL-ICE and regular external AVR board. For a trivial mod, the XMINI works well enough. That's still 11 bytes more than the STK500 has free - put it to good use! The STK500 has only got an 8kB AVR. To fit encrypted bootloader as well as the application firmware. The real mystery is the Dragon. It seems to have "big enough" chips. But moderate performance. This datasheet doesn't have the memory map diagram in section 6.2, while this one has a ridiculously small diagram. These are the new Microchip style datasheets, I suppose they decided they must be less than 500 pages at any cost. I'm all for more compact documents, but not sacrificing readability like this. I think that's not the right binary, it seems like a test file. I edited link in previous post. You have to upload FLASH hex first, and than corresponding EEPROM binary dat file. @edit I added elf files for simplicity. They contain both FLASH and EEPROM. So, anyone knows what are those? How many are they? The ATtiny417/817 devices provide four General Purpose I/O Registers. These registers can be used for storing any information, and they are particularly useful for storing global variables and interrupt flags. General Purpose I/O Registers, which recide in the address range 0x1C - 0x1F, are directly bit-accessible using the SBI, CBI, SBIS, and SBIC instructions. Then we could use avrdude to program these new chips. Add support for the UPDI interface. This programming and debugging interface is used in the AVR8X (2017->) series of devices and is supported in JTAGICE3, AtmelICE, EDBG, mEDBG, nEDBG and PowerDebugger. Let's see how it goes. I'm working on something like that too, but if the avrdude guys make it talk UPDI, so much the better. CodeVisionAVR plans to support the new parts. Well, that shows what THEY think is important. I found a small error in the datasheet, in the UPDI chapter. But in the relevant register, this bit is described as read only. This is an error; I've verified that this bit is indeed reset by writing a '1' to it, so it should be R/W in the datasheet, with the usual note that it is cleared by writing a '1', like several other AVR flags. Nice. Assuming that the procedure was written correctly to begin with, and that the error is indeed an error based on that assumption, then the same applies to the ATtiny1614/1616/1617 datasheet as well. You found it, have you written up a support ticket yet? EDIT: Morten please add the ATtiny1614/1616/1617 datasheet to the report. Actually, I'm not exactly sure of the best way to report datasheet errors. I don't feel so comfortable sending this to some generic Microchip mail, will they read it? I know some former Atmel people are active here, so I report them here, at least they are visible to everyone. There is a specific "channel" for reporting errors in technical documentation. Go to microchip.com, then Contact Us (at bottom of page), then under Literature Requests there is a specific link for reporting document errors. Ah, ok, i see it. And if you do, include the tracking number I mentioned (just so that support can connect the dots). It's ok, you already reported, so no need to duplicate. 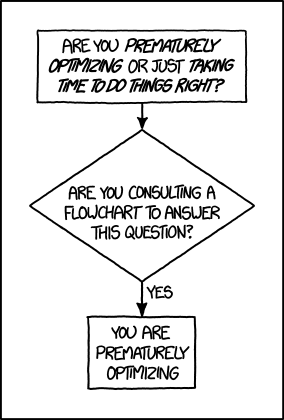 I'll remember the procedure for the next error I find. 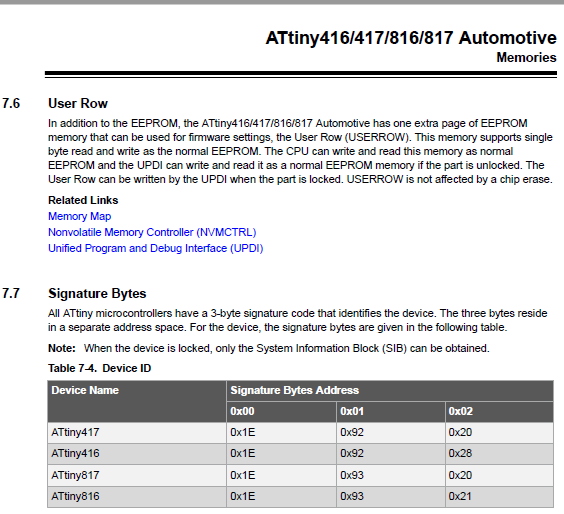 If you look in the microchip AVR selector guide these xtinys EEPROMs are called HEF where all others are just EEPROMS. I checked the data sheet but it don't have HEF in the text! Does anyone know what it stands for? Look up hef in Wiktionary, the free dictionary. 1.3.172 (2018-02-19) ... 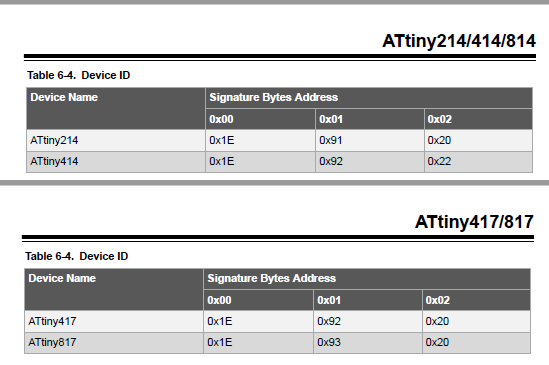 Corrected Fuse register group size for ATtiny1607-family, ATtiny1617-family and ATtiny3217-family. 1.3.169 (2017-12-18) Added support for ATtiny1607, ATtiny1606, ATtiny1604, ATtiny807, ATtiny806, ATtiny804, ATtiny406, ATtiny404, ATtiny402, ATtiny204 and ATtiny202. 1.3.147 (2017-10-02) Updated AVR8X simulator models. 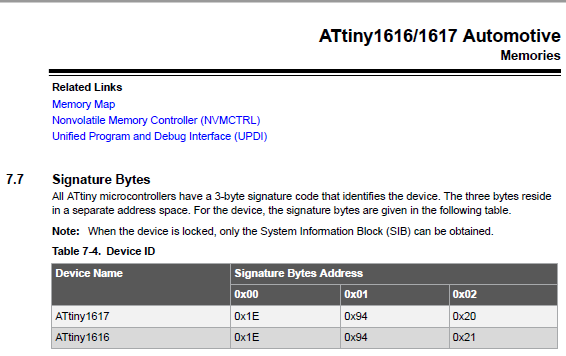 1.3.132 (2017-07-04) ... Added Hi-/Lo-byte-address defines for 16-bit registers in assembler include files for the new tiny's. Added simulator model for ATtiny3217, ATtiny3216 and ATtiny3214. Complete guess: High Endurance Flash perhaps? Well, considering David provided the answer in post #336 that is a very good guess. Anyone know device id for ATtiny417/814/816/817 ? I can't find information about it in datasheet. or page 20 in Full datasheet. Make sure you are looking in the latest, Microchip branded, datasheets. Not the original Atmel one. The data sheet of microchip was not made in time. You can also get all the signatures for the new chips from the latest version of avrdude.conf. Thank you for all of you who replied. I'm using attiny814 as my target dev. I'm in progress to build programmer for updi mode. I had design 5 modes (ISP, HVPP, HVSP, PDI,TPI[lo & hv]). UPDI is the last mode. I need more avr chip for testing and added to programmer database. I'ts hard for me to get samples where I leave (in Indonesia), may be anyone can help me to get sample from Microchip. I'll publish lite version after finishing UPDI mode. PC software created using Lazarus (can be compiled for windows, linux, mac), for now I had only windows. Is it possible to program attiny817 / 1616 via eclipse?